Introduction: Transient post-operative dysphagia is not uncommon after laparoscopic anti-reflux surgery and usually runs a self limitng course. However a subset of patients has long term dysphagia. 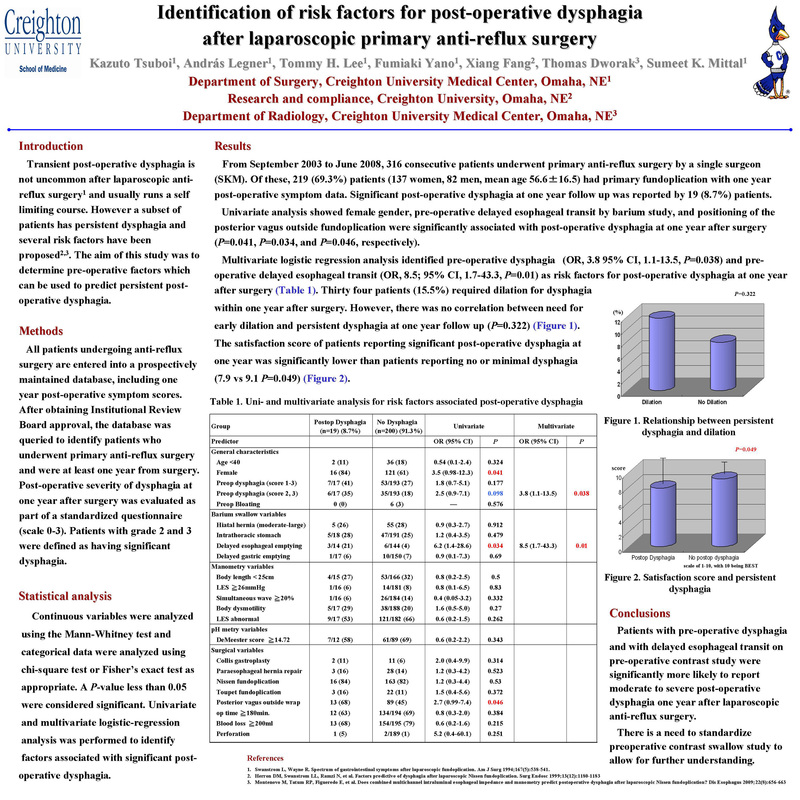 The aim of this study was to determine the risk factors for persistent post-operative dysphagia at one year after surgery. Methods: All patients undergoing anti-reflux surgery are entered into a prospectively maintained database, including one year post-operative symptom scores. After obtaining IRB approval, the database was queried to identify patients who underwent primary anti-reflux surgery and were at least one year from surgery. Post-operative severity of dysphagia was evaluated using a standardized questionnaire (scale 0-3). Patients with grade 2 and 3 were defined as having significant dysphagia. Results: From September 2003 to June 2008, 316 consecutive patients underwent primary anti-reflux surgery by a single surgeon (SKM), of these, 219 (69.3%) patients (137 women, 82 men, mean age 56.6±16.5) had one year post-operative symptom data. Significant post-operative dysphagia at one year after f/u was reported by 19 (8.7%) patients. Univariate analysis showed female gender, pre-operative delayed esophageal transit by barium study, and positioning of the posterior vagus within fundoplication were significantly associated with post-operative dysphagia (p=0.041, p=0.034, and p=0.046, respectively). Multivariate logistic regression analysis identified pre-operative dysphagia (OR, 3.8 95% CI, 1.1-13.5, p=0.038) and pre-operative delayed esophageal transit (OR, 8.5; 95% CI, 1.7-43.3, p=0.01) as risk factors for post-operative dysphagia at one year after surgery. Thirty four patients (15.5%) required dilation for dysphagia within one year after surgery. However, there as no correlation between need for early dilation and persistent dysphagia at one year f/u (p=0.322). The satisfaction score of patients reporting significant post-operative dysphagia at one year was significantly lower that patients reporting no or minimal dysphagia (7.9 vs 9.1 p=0.049). Conclusion: Patients with pre-operative dysphagia and with delayed esophageal transit on pre-operative contrast study were significantly more likely to report moderate to severe post-operative dysphagia one year after laparoscopic anti-reflux surgery.